I first heard of the Titanic when my folks gave me a copy of Walter Lord's "A Night to Remember" in 1958. I immediately fell in love with the ship, the people, and the enormity of the tragedy. 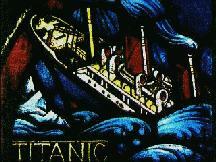 When the Titanic sank on April 15, 1912, off the coast of Newfoundland, there were over 1,500 casualties. Uncounted among them was the end of an age of innocence and a way of life of which many had unshakable faith. No more would class distinction determine who lived and died. The very fabric of society was about to undergo wrenching changes, many of them presaged by this disaster. That night, there was heroism, sacrifice, and cowardice among the passengers and crew. To this day, there are very real questions relating to the cause of the disaster, its effect on our society, and what really happened that night. This is a great human story, with cultural significance, old and new controversy, and a wealth of trivia. This exhibit is my attempt to show the events leading up to the disaster, and the impact that has been felt over the years. As a result, you will find my opinions scattered throughout. If you find any inaccuracies, or have any comments, please e-mail me at webmaster@dellamente.com. I do not pretend to be the last word on the events surrounding the sinking of this great ship. As Walter Lord so elequently said, "It is a rash man indeed who would set himself up as the final arbiter on all that happned the incredible night the Titanic went down." Note: As with any research effort, these pages contain information garnered from many sources. To the best of my knowledge, I have followed the guidelines for Fair Use as outlined by the U.S. Copyright Office. Use of the images and text has been attributed wherever possible. Copyright © 1995-2012 Michael Disabato.